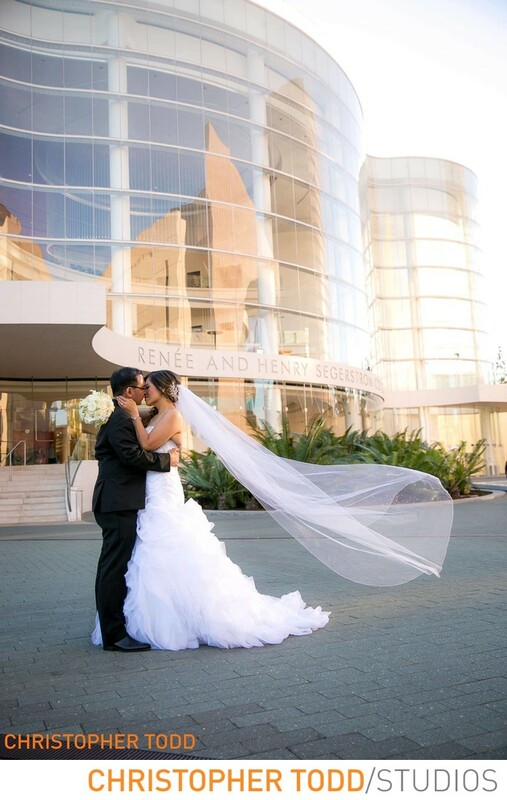 I am an Orange County photographer that had the privilege to photograph this beautiful bride and groom at the Segerstrom Center for the Arts in Costa Mesa. The architecture of the concert hall is stunning and makes a great backdrop for this photo. Although the couple got married in a Catholic Church in OC they wanted some fun romantic bridal portraits. So we found ourselves here after the ceremony. The reception was held at the Avenue of the Arts Hotel which is just up the road from here. We had so much fun walking around and taking great photos. They are going to look perfect in their custom wedding album. 1/320; f/2.8; ISO 200; 33.0 mm.